The ENO SingleNest Hammock is simple to use, lightweight, durable and best of all incredibly comfortable. This hammock is great for anywhere. Whether you are backpacking, car camping, traveling or just putting it up in the back yard for the whole family to enjoy. You are going to love the feeling of hanging out in the ENO SingleNest Hammock. Everything comes in just one little tiny package including the storage sack. The ENO SingleNest makes a great gift for anyone who loves a hammock. Have fun, enjoy and remember the best feature of the ENO SingleNest is how it let’s you Relax! The parachute-style hammock is made of breathable woven nylon microfiber that offers superior strength and wear resistance. The SingleNest also comes complete and ready to hang with high-quality steel carabineers and strength-tested nautical-grade line. And when you’re ready to pack up, the hammock stuffs into an attached compression sack, making it easy to carry. All told, the SingleNest offers backpackers the luxury of hammock camping without the bulk and weight. 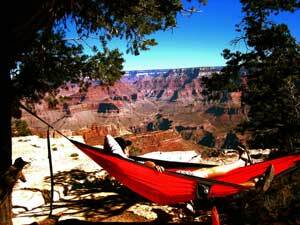 The SingleNest hammock, which holds up to 400 pounds, carries a two-year manufacturer’s warranty. Brothers Peter and Paul Pinholster opened Eagles Nest Outfitters after embarking on a cross-country adventure in the summer of 1999. The pair had set up shop in their sister’s garage sewing hammocks and slap straps, with the goal of traveling the East Coast selling their products at music festivals and community gatherings. They initially lived out of their seen-better-days mini van while building a thriving business. While vending at festivals along the Appalachian Trail, a friend suggested they set up permanent shop in Asheville, North Carolina. In short order, the brothers established themselves high up on the Blue Ridge Mountains, where they continue to supply hammocks and accessories to like-minded people all over the world.